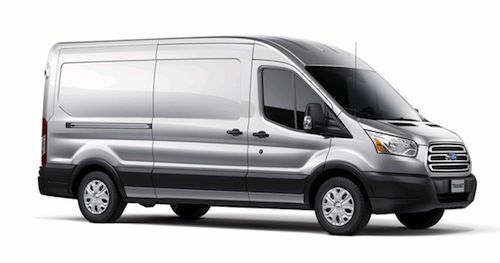 Ford has announced they are offering a new 3.2-liter Power Stroke diesel, and it will make its North American debut in the all-new 2014 Ford Transit. The diesel is a proven engine around the globe and now Ford is bringing their second Power Stroke diesel to North America. The new powerful and efficient diesel powerplant will join the larger 6.7-liter Power Stroke workhorse that powers the Ford F-Series Super Duty trucks. The new five-cylinder 3.2-liter diesel will be new to the U.S., but its been a proven workhorse around the globe in the Ford Ranger pickup. It will be a perfect match for the all-new 2014 Ford Transit full-size commercial van that goes on sale next year. The already proven 3.2-liter Power Stroke Diesel will be the only five-cylinder diesel available in a commercial van in North America. There has been an absence of small diesel engines for commercial vehicles in the U.S., and this will be a welcome addition for small business and commercial fleets. Diesel engines are highly efficient and are used extensively around the globe in cars and small commercial vehicles. Ford will be the first automaker to make the commitment to pass the more stringent EPA standards and get the small diesel engine certified here in the U.S. for commercial use. Power has not been certified yet here in the U.S., but it’s rated in Europe at 197 horsepower and 347 lb. ft. of torque. The substantial torque will make the five-cylinder diesel an ideal powerplant for the full-size commercial Ford Transit. The new 3.2-liter diesel will be turbocharged, and will be powerful, clean and fuel-efficient. It will feature state-of-the-art piezoelectric fuel injectors fed through a high-pressure common rail fuel system, and advanced emissions technologies. The new Power Stroke diesel will feature all of the latest technology like cast-aluminum, low-friction coated pistons with piston-cooling jets, and a water-cooled high-performance electric-controlled exhaust gas recirculation valve. Both will contribute to cooler operating temperatures under extreme operating conditions. The new Power Stroke diesel is one of several engines that will be available for the new Transit in North America, including the 3.5-liter EcoBoost gasoline engine. All engines will come mated to a Ford 6R80 six-speed automatic transmission. The 3.2-liter diesel is already manufactured in Ford’s Struandale Engine Plant in Port Elizabeth, South Africa for use in the global Ford Ranger. It will be exported to Ford’s Kansas City Assembly Plant in Claycomo, Mo., which received a $1.1 billion investment for the all-new 2014 Ford Transit. Commercial fleet owners will now have a highly efficient diesel offering, as Ford is stepping up big-time with the new Power Stroke 3.2-liter diesel.